David Levering Lewis, who won a Pulitzer Prize for each of his two volumes telling the life of W. E. B. Du Bois, takes as his newest subject the lawyer, businessman, and unconventional US presidential candidate Wendell Willkie, who migrated from the Democratic to the Republican Party in 1939 and caught an unexpected wave of popular support in the lead-up to the 1940 election as an alternative to the incumbent Democratic President, Franklin Roosevelt. There are surface levels on which a new Wilkie biography looks pointedly opportune in 2018. The man affected a rough-hewn populism and a political naivete, both designed to counterbalance the patrician polish of Roosevelt. Fortunately, Lewis spends little time on the surface levels; the last thing the reading market needs is the refashioning of Wendell Wilkie into some kind of Trump manqué. Rather, The Improbable Wendell Wilkie delves shrewdly and deeply into the fundamentals of the man and his time. Lewis clearly wants to create the most rounded personal and political portrait of the odd phenomenon of Wendell Wilkie yet written, the kind of clear but sympathetic assessment that phenomenon has always deserved but that comparatively few historians are equipped to make. Wendell’s farm-boy haircut, hayseed manners, and sartorial indifference bespoke a common-man straightforwardness - “grass roots stuff,” said a wary FDR. But this businessman-turned politician possessed a supple intellect, a remarkable fund of knowledge, and a concealed disdain for parochial ideas. Indeed, he was constantly to surprise many admirers and bitterly disappoint more than a few intimates who mistook Wilkie’s small-town Hoosier origins and big business success as the sum of the inner man. In a pitch-perfect simply line, Lewis writes that Wilkie “channeled responsible bipartisanship as the health of democracy,” and his Wilkie is forever doing this, reaching across party lines, acting according to his own principles, innate warmth, and boisterous humor (in encounter after encounter, and in almost all of the book’s photos, he seems to be the only one having fun). These traits have always made Wilkie as attractive to biographers as he was to his many thousands of followers, but no previous biography has given the modern reader this kind of immediate sense of why that might be so, of the multifaceted appeal of the man. 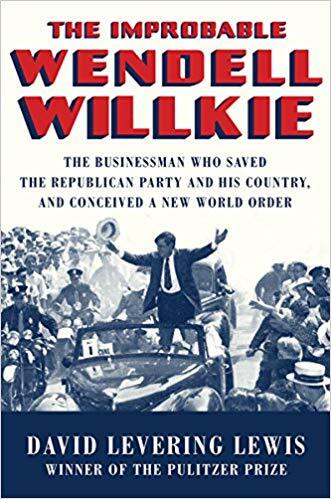 Wilkie died at age 52 in 1944, and if Lewis is over-generous in assessing the effect he had on both the Republican Party and the broader world, the impulse is certainly understandable. There’s a new and punchy appeal to a populist who actually knows ordinary people, a businessman who actually succeeded in business, an author who actually wrote his own popular book, and a lively public speaker who entertained crowd with talk of fellowship and hope instead of hate and delusional conspiracies. Also: Wendell Wilkie loved dogs, and they loved him.